Tailor-made marine coverage. Imagining you have it could leave you out in the cold. In the maritime world, your business is as individual as you are. So, doesn't it make sense that your insurance should be that way too? 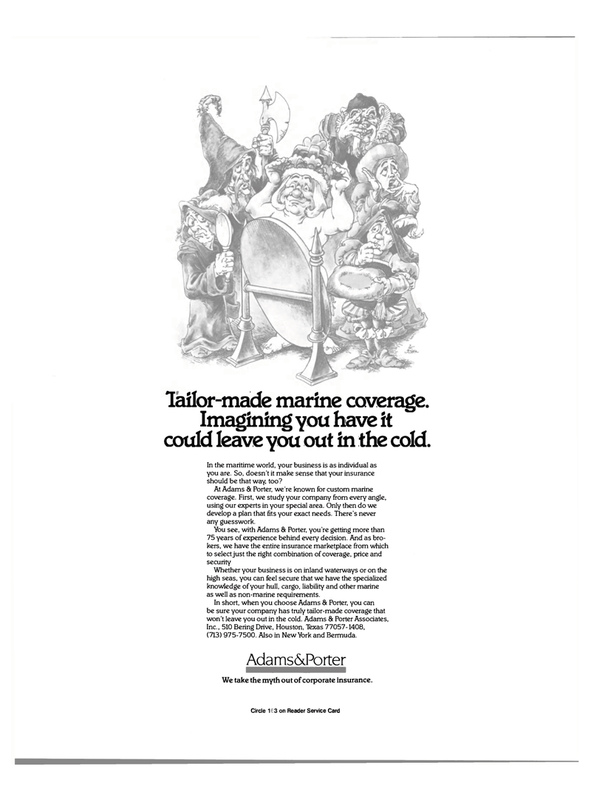 At Adams & Porter, we're known for custom marine coverage. First, we study your company from every angle, using our experts in your special area. Only then do we develop a plan that fits your exact needs. There's never any guesswork. Whether your business is on inland waterways or on the high seas, you can feel secure that we have the specialized knowledge of your hull, cargo, liability and other marine as well as non-marine requirements. Inc., 510 Bering Drive, Houston, Texas 77057-1408, (713) 975-7500. Also in New York and Bermuda. We take the myth out of corporate insurance.